Demonstrating impact is a hot topic. Terms such as outcomes framework, Theory of Change, Cost Benefit Analysis, causality and soft versus hard outcomes are increasingly commonplace and it can be overwhelming figuring out what this all means and how it applies to you. In music education evidencing impact is often a complicated business, and funders require different types of evaluation. With impact and evaluation set to become an ongoing priority in music education over the coming years, we are delighted to announce two initiatives to ignite new learning and bring clarity and coherence to a complex field. 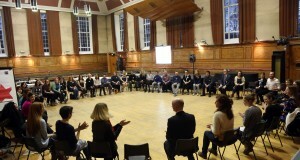 Originally conceived by London Music Masters, the DIME steering group has broadened to include Pro Bono Economics, Project Oracle and Sound Connections, and more than 20 other organisations have participated in a series of roundtables and workshops. On behalf of the partnership we are pleased to launch a briefing paper outlining what has happened so far; information about what will happen next; and a summary of resources and information. The next step for the DIME steering group is to better understand the impact measurement needs of music education organisations and identify how best to support these needs. If you would be interested in receiving 1-to-1 support to develop your impact measurement skills. Alongside DIME, which is open to the wider music education community, here at Sound Connections we are embarking on a three-year programme of impact and evaluation development specifically for our Challenging Circumstances Music Network. Identified by the network as a priority need, the programme will involve training from impact measurement experts, 1-to-1 tailored guidance and tools and resources aimed at small organisations working in non-formal settings. We are grateful to the City Bridge Trust for supporting this work.